Since I'm enjoying on reviewing books and joining a bookworm community here, in Indonesia, called Blogger Buku Indonesia (BBI), I wanted to share things related to books. I shared things about books in my blog about book, but I only shared my wishes and reviews there. Someday, my hubby told me, that he wanted me to keep on sharing things. He said that he loves to see me doing scrapbook. He said I could do things related with scrapbooks and books. There came a bulb twinkling over my head. What about making some bookmarks to share for free? 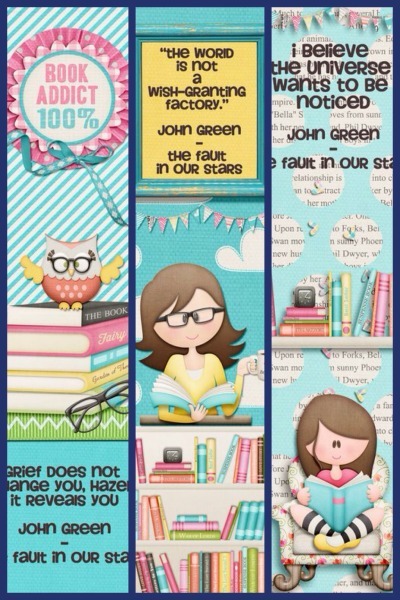 I think this idea will worth it for everyone in the world who loves reading and collecting cute bookmarks. So, here I am, proudly presenting you my first bookmarks to share. Thank you, Thaty Borges, for the idea of making earlier bookmarks as freebies. I bought her kit, The Books Club, and started to make these bookmarks. I also made a banner for my 2013 Reading Challenge - Books In English using this kit. Like it? You can download them here... Enjoy them! So cute - thank you for sharing!